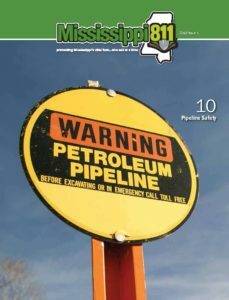 Mississippi 811, Inc. (MS811) online locate request submission option is made available as a convenience to Mississippi homeowners and individual excavators. As a user of the MS811 online locate request submission option, I will supply the requested contact information accurately as well as a valid email address to where processed locate requests confirmations will be sent. Most Locate requests that are submitted through online, between 7:00am and 4:00pm, Monday through Friday excluding observed holidays, will be processed by MS811 on the same business day. Requests submitted, after 4:00pm, Monday through Friday or on observed holidays will be processed on the next business day. I understand that locate request tickets submitted online are not valid or complete until I receive email confirmation (in the form of the processed locate request ticket) from MS811. I will be responsible for verifying that the information contained in the email confirmation is accurate and complete. I assume all responsibility and agree to only submit locate requests online that are in compliance with MS state law and will be responsible for timely notification and for the accuracy and completeness of the locate request information that I submit. I understand that I should notify any utility companies that are not in compliance with state law, as well as, any governmental and/or Railroad permit offices. Most utility companies will only mark up to their meter or the property line if there is no meter. Privately owned lines, such as natural gas, electric, water, sewer and propane service lines may not be located by the member utility. I understand that I will be responsible for having these lines located. Locate request numbers are valid for 14 calendar days from the date and time it is processed or entered into the system by MS811. I understand that should my excavation exceed this expiration, I will need to renew the notification with MS811, at least 2 and not more than 3 working days prior to the expiration and that I must allow the utility owners 2 working days to re-mark the lines. All information and data on this website is subject to change without notice. I understand and agree to all of the terms contained within the Mississippi 811 Online Locate Request Submission Agreement.